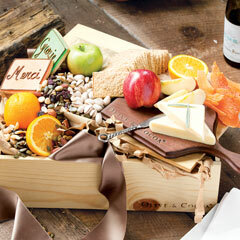 Send sincere thanks with wise words and a bit of chocolate covered bliss. 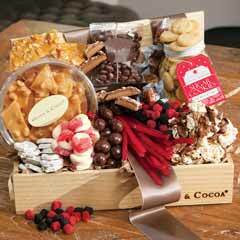 Filled with sentiments of gratitude and inspirational quotes, our “Thank You" book comes paired with milk and white chocolate dunked cookies, malt balls, graham crackers, raisins and toffee almonds, all gift wrapped together in a hand crafted wood crate with ribbon. Thank You Book & Chocolates is rated 5.0 out of 5 by 20. Rated 5 out of 5 by crafty31 from Greatly appreciated I sent this to thank the people who bought my last home. They were very understanding when I needed packages and mail redirected to my new house on several occasions. They sent me a note advising that they loved the chocolates and planned to put the thank you book in their (newly expected) baby's room. Rated 5 out of 5 by tbrown0531 from Teacher's Appreciation Gifts I bought this for my sons' teachers for Teacher Appreciation Week. The teachers absolutely loved the gift. From the packaging to the contents, each teacher said they felt spoiled and much appreciated. 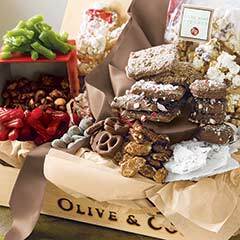 Olive and Cocoa has exceptional gifts for any occasion. The quality is superb. Rated 5 out of 5 by JAM1 from A great to say Thank You! Purchased this for my granddaughter's 15th Birthday! A great way in creating a teachable moment in providing a book celebrating gratitude and planting that seed in the value and art of writing and expressing a heartfelt thank you for being our smart, wonderful,and beautiful granddaughter!!!!! 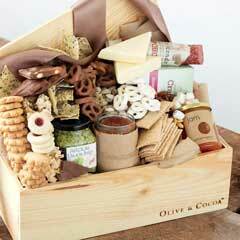 Olive & Cocoa only use the best quality in everything they create!! Rated 5 out of 5 by Spaz from I got this as a gift for a job promotion moving from one department to another. Everything was awesome. It was packed so nice and the chocolate was to die for. Rated 5 out of 5 by Joy8 from Terrific Thank You Gift So well received! Really nice. Bought this as a thank you gift. She loved it! Rated 5 out of 5 by KrissyRu from Beautiful, Quality and Delicious! I sent this to my daughter's teachers for Teacher Appreciation Week and it received RAVE reviews. They absolutely loved it and the quotes in the book were wonderful. They just loved it so much. Highly recommend! Rated 5 out of 5 by Cardinal from Best Gifts for any Occasion! 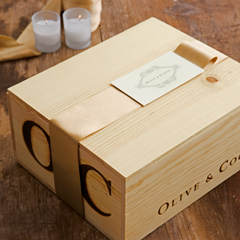 Every gift bought is magnificent because it is done with attention to detail and very unique! For those of us that want something special that surprises and delights and exhibits our desire to give the very best this is where you get it! Thank you for a job well done!